Labels and nameplates have become much more than just branding a product or identifying the source of manufacturing. With all of the barcoding options available today, a simple label can contain a wealth of data and information. None more than UID barcode labels. No longer are you limited to barcodes that only contain a serial number. With UID barcodes, you can store 100X that data in a single, small square of uniquely shaped dots. The advantage of 2D barcodes, such as UID (unique identification marking), is that the label’s barcode contains a unique item identifier encoded in a 2D data matrix barcode. Along with human readable tracking information, this barcode can give you more control over tracking and is part of MIL-STD-130, a common standard referenced for Department of Defense manufacturing. Benefits of UID labels are vast, including that they provide a globally unique, unambiguous identifier that eliminates confusion in data bases and records. The second benefit is that manual recording is replaced with electronic scanning providing for faster recording and cost savings over time. Less confusion, time and cost savings, who doesn’t want that? Assuming you seek these benefits or it is mandatory that your products use UID labels, how do you go about purchasing something you don’t understand yourself? The answer is to leave it up to the experts. What should you look for in a UID label supplier? The supplier should walk you through the process. There is a learning curve to MIL-STD-130 and the requirements for UID labels are not easily understood. We will tell you what information we need from you to insure an accurate and compliant UID barcode. Many of our customers don’t have time to learn what a “data identifier” is or the precise differences between Construct 1 and Construct 2. After you give us the critical information we ask for, we take care of the rest. The supplier should be able to scan and verify the barcodes. To insure accuracy and scanning ease, we test and verify the barcode during multiple steps in the manufacturing process. We have scanning and verifying equipment on-site to grade the barcode. Verification reports are generated and available upon request. Make sure the supplier can generate high resolution images on durable materials. Unfortunately, UID barcode accuracy and compliance isn’t the only thing you need to insist upon. Printing and manufacturing processes need to be precise, consistent and durable. Don’t assume artwork that scans perfectly will result in labels that scan perfectly. A UID barcode may be perfect on the artwork but fail to scan accurately (or at all) on the finished label or nameplate. With our Metalphoto nameplates and digitally printed labels, you can be assured the highest resolution output, quality that rivals the finest printing. All of our printing processes are consistent from the first label to the last. No worries that you’ll have an unreadable barcode out in the field or half way through your order. Reliable barcodes whether you order 10 or 1000 plates is what you should expect. Consider the environment your plates or labels will be in. UID labels are designed to minimize the loss of valuable data over many years. The data collected and stored from the UID label will last indefinitely and so should the label. Another reason why we have chosen to manufacture only durable labeling. Our Metalphoto plates can last for decades outdoors. The image is photographically produced and sealed into the nameplate making it the most abrasion resistant on the market. Anodized aluminum is a superb choice for UID labeling. Available in thicknesses from .003 foil to .063 and produced in-house. For harsh environments, look no further than our Metalphoto UID nameplates! If you prefer non-aluminum, we can manufacture vinyl and polyester labels with overlaminates for extra protection from weather and abrasion. All with high quality UID barcodes printed in high resolution. Don’t assume a good label manufacturer is also experienced at UID labeling. A label manufacturer that makes nice decals might not be the best choice when it comes to specialized UID labeling. To avoid issues down the road, make sure you buy from a supplier with knowledge and experience in the UID arena, and one that can image on durable substrates with consistent output. Please call or email us for a quote. Whether you need a quantity of 1 or 1000, we’re happy to assist you! Do I really need an overlaminate on my labels? Overlaminates are optional on all of our vinyl, polyester, and digitally printed aluminum materials. Optional should mean not always necessary and may even be overkill for many label applications. We only stock stable, durable roll and sheet materials. All printing processes we use to image these materials can withstand abrasion, handling, weather and water. The question you have to ask is to what extent your labels will be subjected to these circumstances. If my customer’s budget is unlimited, which is rarely the case, I side on the recommendation of ordering an overlaminate, just in case the labels will be subjected to harsh conditions not foreseen. The labels will be outdoors for extended periods of time. The labels will be handled/touched regularly. The labels will be subject to cleaning and/or solvents due to where they are placed. The label itself needs to be thicker. (An overlaminate can add 2 to 5 mils or more to overall thickness). If purchasing offset printed, inkjet or laser printed labels, an overlaminate is strongly recommended as a drop of water might erase your image. Not worth the risk. It’s not so clear cut with our durable printing options. Contact us anytime for guidance as to whether we think you can get by without an overlaminate in your specific application. We are more than happy to use our thirty years of experience to help answer that question and save you money when we can. It is our goal to sell you labels that will last, but not necessarily longer than they need to. If there is one area of nameplate performance that is often overlooked by buyers needing identification that will last on their product, it is the serial number. Often, the serial number is the most important image on the plate. If the serial number is unreadable, customers are unable to provide that valuable information to the company they are relying upon for warranty or product information. In many cases, the serial number is the one traceable identification of that specific product. Companies rely on that number when collecting vital data in the field, remotely, or on-site. Unlike many other nameplate and label companies, we embed the serial number into the anodized aluminum the same way we do the rest of the image. Therefore, the number is durable for years to come without worry. The number will resist abrasion, weather, most chemicals, and any other abuse someone or something throws at it. Many of our customers don’t know the serial number until the last minute. Sometimes the only option is to stamp in the number “after the fact.” We believe this should be our customer’s choice. With our digital printing of non-metal labels, we can serialize at no extra cost. This is a huge advantage over traditional screen printing. Nameplates and labels used for product identification can look awesome when ready to ship to a customer regardless of how the serial number is put on them. The question is how will the serial number look 5 or 10 years from now? Or if exposed to weather? Will the serial number corrode or get distorted if in a harsh environment? We take product identification seriously and want our serialization on our labels to last as long, and hopefully longer, than the product it is placed on. How Many Labels Should I Buy? Will I get a better price if I buy a higher quantity? Type of material: If ordering aluminum nameplates, your best bet is to maximize a sheet of material. So the more plates we can fit on a 10″ x 12″ or 12″ x 20″ sheet, the lower your price. For non-metal materials like vinyl and polyester, our printable area is about 12″ wide (length doesn’t matter). Method of attachment: This is probably the most important consideration when deciding on quantity to order. We recommend 6 months to 1 year’s worth estimated usage if the labels have adhesive. You don’t want adhesive-backed labels sitting on a shelf longer than a year. You want to know that the labels will stick to your surface and stay there once applied. If riveting on anodized aluminum nameplates, order as many as you like. They will last forever on a shelf! Size of label: With our production processes, the larger the label, the less need to order more to get a good price. If we are maximizing the yield on the material, order only what you need. If your labels are tiny, it may be wise to order 50 instead of 10, for example. Overall cost of order: Just because you might get a better bang for your buck ordering a higher quantity doesn’t mean you should. Take a look at your estimated usage and the total cost of the order. The total expenditure will be less if you order only what you need than if you order more. So if you’ll end up throwing extra labels away, why pay for them in the first place. We are happy to provide guidance at the time of your quote request. We only “sell” you what you need. We will never entice you to increase a quantity unless it makes economic sense for you to do so. Durable nameplates and labels should not be viewed in the same light as purchasing paper business cards or throw-away address labels. In those cases, printers would rather run thousands than hundreds once their machines are set-up. The best value is a nameplate or label that meets the durability needs of your environment. After all, if the labels don’t last, then you know you’ve wasted your money! Need advice? Use our helpful “Label Wizard” on our website or contact us for personalized attention you can count on to make the right decision. If we can be of assistance, please let us know! If you desire a great looking label, look no further than Lexan®. Any designer will confirm that texture adds a richness to design of any kind. Lexan® is a polycarbonate belonging to a group of thermoplastic polymers. The labels are usually reverse printed on the rear side. This gives the printed image added protection from abrasion and fingerprints. The Lexan® materials we stock have a velvet texture on the surface. There is very little glare and while the texture may appear matte, it is very unique in appearance. 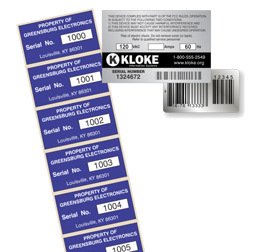 Commonly seen on everything from exercise equipment panels to appliances, Lexan® labeling is rich-looking. Colors can appear slightly muted but rather than take away from the overall appearance, in my opinion, it enhances it. We stock a 10 mil thick Lexan® for reverse printing with digital UV inkjet. It comes without an adhesive which is an advantage. Most label stocks come with adhesive already on the rear side direct from the material manufacturer. When using a non-adhesive backed material we have total flexibility to add the appropriate 3M adhesive for your application. This polycarbonate only comes in clear so all color, including backgrounds, must be printed. There are 3 considerations when specifying 10 mil Lexan® for your labels. One, this material is more costly than a vinyl or polyester. Two, the color may not be as solid or opaque since the base material is clear. Third, the labels may discolor over time when exposed to UV light. To address these concerns, we often suggest an alternative that provides labels with the exact same look of a pure Lexan® label. An outstanding alternative is our 5 mil Velvet Lexan® overlaminate. We print on an adhesive-backed, solid white, silver or clear vinyl or polyester and then overlaminate the label with 5 mil Lexan®. This laminate has excellent heat stability and resistance to scratches. It is rated 5 year UV stable with UV inhibitors to prolong the color of the graphics. The suggested temperature range of both the 10 mil Lexan® and the 5 mil Lexan® overlaminate is -40F to 212F. If within your budget, Lexan® labels go beyond product identification. They make quite an impression. Be careful about choosing a label for your product just because it’s referenced as “durable”. Durable labels are only as durable as their weakest link. In other words, you may purchase an indestructible label with an adhesive on the rear side that doesn’t stick well to your product. So what good is it to have a label made of steel that falls off?! Or a label that won’t come off but the image is….well…it was there when you put the label on! One of the most common questions I am asked is, “Can you quote me the strongest adhesive?” Once again, if I answered “yes” without probing further, I would be doing a disservice to my customer. There is not one adhesive that is the strongest. It depends on what you’re sticking to. An adhesive that’s great in high heat might be terrible sticking to powder coated surfaces. You can save money by honing in on labels that meet your needs but don’t exceed them. For example, you may need an indoor label that is very resistant to abrasion. You may not require an adhesive that resists rainstorms. If you keep in mind these 3 key variables and communicate this information to us, we can gear our recommendations to insure you really do purchase a durable label that will perform as you expect. A truly durable label is created with a stable imaging method and on a suitable material for your specific application. Welcome to the Photo-Graphics Co. Blog! We are thrilled to be able to communicate, update and inform our valuable customers through the Photo-Graphics Co., Inc. blog! I will share information on label processes and offer tips on purchasing the right label for your application. I will introduce you to key players on our team. Our valuable associates that have made Photo-Graphics Co. what it is today. I’m a freelance writer in my spare time so don’t be surprised to see other commentary about business, leadership, and what it takes to succeed in a small business today. Welcome to Photo-Graphics Co., Inc. Blog. More to come soon.